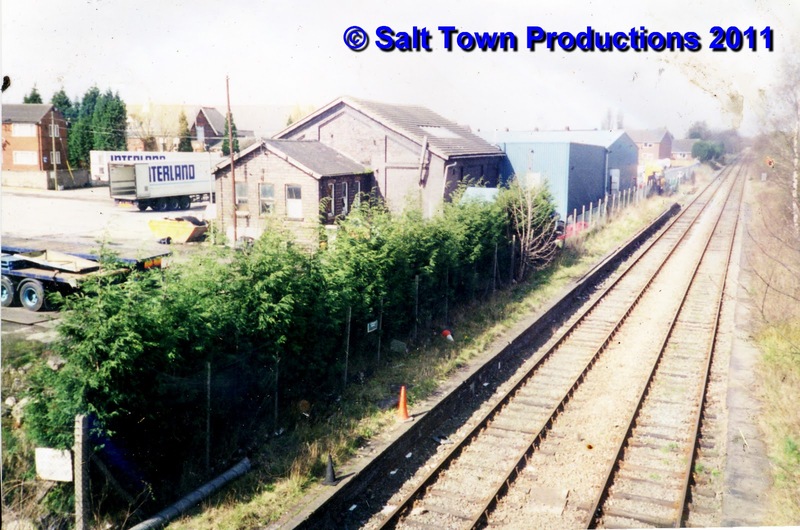 Here's another view of Middlewich's railway station, this time from the early 1990s. 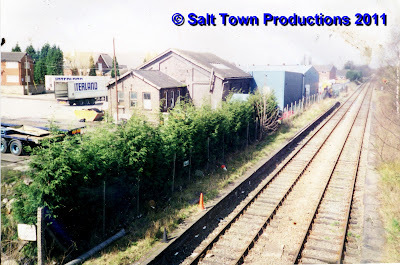 At this time the station yard was being used by Martin's MOT centre, which explains the modern industrial buildings tacked onto the old goods shed. This shed had a platform and crane inside which was used for loading and unloading open trucks and vans. Coal, and (of course) salt were just two of the many commodities handled here. At this end of the shed is the goods office, which remained open until 1967, seven years after the station closed to passengers. Inside were some of those large Dickensian office desks with high stools and a magnificent Victorian brass weighing machine for small consignments and parcels which, I know for a fact, could also be used for weighing people. I was there on one occasion when John Macklin (Norman's dad), the stationmaster, obligingly weighed his secretary on this apparatus when she was on a diet. The preservation of this office was offered as an incentive to the Middlewich Rail Link Campaign (MRLC) to accept plans for housing on the site. The idea was to use it as a booking office for the new station. Pleasing as this might have been, MRLC declined to support the plans because of numerous other problems with them. By the early 90s the station buildings had gone and Martin's offices were now in a purpose built block by the King Street entrance (this can just be seen on the extreme left). The platform edges were, however, still intact at this point and were only removed a few years later to provide clearance for certain new types of passenger train which use the line when diverted via Middlewich. When revised plans were submitted for housing on this site, MRLC was responsible for getting changes made aimed at safeguarding the station site, and, in particular the Northwich bound platform (seen here running alongside the hedge on the left) - the Crewe bound platform, as far as we know, is still owned by Network Rail.. The final plans, as accepted, also made provision for a large car parking space on the site for the use of future passengers. Although the plans were modified to, theoretically at least, provide for the future re-opening of the station it was found that, in reality, the Northwich platform had been encroached on by the building of garden fences etc and so attention turned to a different site for the new station on the other side of the road bridge. This was fortunate because certain local estate agents had sold houses and apartments on the site by telling potential buyers that there was 'no chance whatsoever' of the line re-opening to passengers. I know this because one lady who had just bought one of the houses rang me to ask for my assurance that there would be no attempt to bring back passenger trains. An assurance that I was not, of course, able to give her. Amazingly we still get the occasional grumble from people living near the line about the noise from trains. MRLC's response is always the same: if you don't like the sound of trains, don't live near a railway line. It has, after all, been there since 1867.